In Spike Lee's latest documentary, If God Is Willing and Da Creek Don't Rise, Katharine Montana explains why she chose to live in Humble, Texas, after levee floods destroyed her New Orleans home. "I was forced to make a financial decision for one simple reason," she tells us. "There is no education system for my son, who has autism. I am up here for that one purpose, and there are thousands of other families who can't go back because they have children who are disabled." In an interview with The Root earlier this year, Spike Lee echoed the same argument. The problem is — it's wrong. Schools in New Orleans do accept kids with special needs. However, Montana is right that under the current education system, in which most city schools have been taken over by the state, and many of those converted into independently chartered schools, it's become extremely difficult for students with special needs to find a school for enrollment. For those who do land in a school, services for students with mental disorders, behavioral problems and physical handicaps are lacking. Montana is also right that more parents like her haven't moved back for these reasons. Families have attempted to place their disabled children in schools, but they have either been told that the school doesn't have special-needs services or been told, gently, that their child would be better served at another school. These problems occur often enough that a due-process complaint has been filed against the Louisiana Department of Education on behalf of 4,500 students in the city with disabilities. These issues have conveniently been left out of a number of Pollyanna-ish media reports touting the messianic nature of charter schools, and how Hurricane Katrina was a "blessing" to New Orleans' children. A recent article at The Grio, "New Orleans Charter Schools Redefine Education Reform," reads: "The standardized test results for fourth, eighth and tenth grade public school students have gone up since the storm hit in 2005. This may have something to do with the increasing presence of charter schools, though it is not clear." But test scores in those grades were already rising before the storm hit. Between 2003 and 2005, fourth-grade math results grew by 9 percent. Between 2007 and 2009, those results grew by 9.5 percent. In eighth-grade math, the growth in the percentage of kids scoring above basic levels between 2003 and 2005 was greater than the gains between 2007 and 2009. There has been a slight improvement in eighth-grade English and in math at the high school graduate level, but in both categories, the improvement in test scores builds on progress that was already occurring before the mass chartering of New Orleans. So far no link has been found between improved test scores and charter schools. A report on education included in "The New Orleans Index at Five," a study released by the Greater New Orleans Community Data Center and the Brookings Institution, states that a "correlation between academic growth and the major post-storm reforms has not been demonstrated." Still, that isn't nearly so bad as a blog by Jonathan Cohn of The New Republic, who traveled all the way to New Orleans from Washington, D.C., only to ask whether it was possible that Hurricane Katrina was a good thing. He "tweaked" his question, he says, for readers who may have misunderstood him, but he still asks if Katrina "did residents a favor or two." This echoes U.S. Education Secretary Arne Duncan, who said "the best thing that happened to the education system in New Orleans was Hurricane Katrina. … It took Hurricane Katrina to wake up the community." So which residents got those favors? More than 100,000 people who lived in New Orleans have not moved back, either by choice or because they can't. After the floods, the Orleans Parish School Board didn't open the schools, having no money to do it, and the teachers' union contract expired. That school year of 2005-06, all school employees — more than 7,500 teachers and principals — were laid off. Of those teachers, 75 percent were African American. When schools opened in the 2006-07 year, most fell under the state-run Recovery School District (RSD), an "educational unit" for failing schools that was created before Katrina. The schools were staffed with a new crop of teachers, most from outside the state and from national programs such as Teach for America. With no jobs, and with public and low-income housing still not revived by this time, many native teachers were not able to move back to New Orleans. 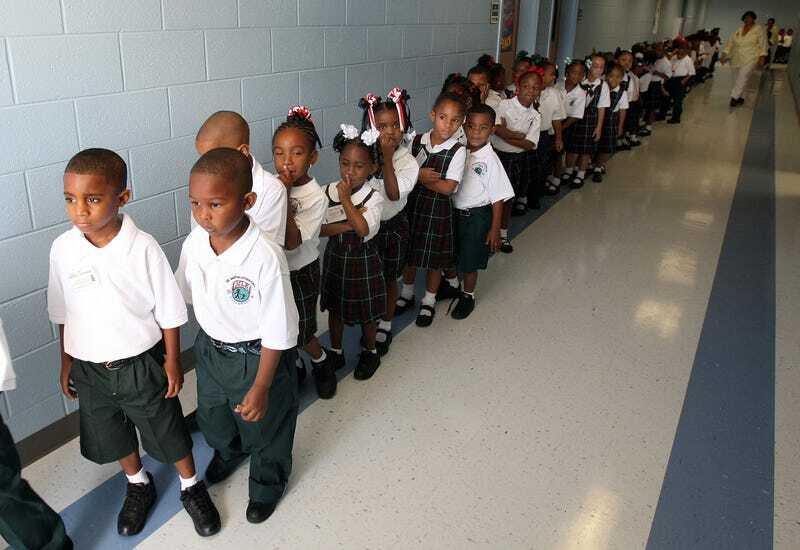 Today only 38,000 students are enrolled in New Orleans schools, compared with 65,000 in the year before Katrina. You simply cannot make the argument that test scores are improving without figuring in the fact that some 40 percent of students — a lot of them struggling with poverty and disabilities, the kinds of students who might well lower test scores — haven't come back. One indicator that many poor families won't be coming back is that, for the first time, New Orleans' suburbs now have a higher number of low-income families than the city: 92,752 versus 67,861. "You can't talk about improving test scores unless you talk about poor children," says Karran Harper Royal, an education advocate and community organizer. "The only ultimate accountability is looking at how the children are doing." The School Performance Score (SPS) is used to determine whether a school is failing and is eligible to be taken over by the state. Under the legislation that expanded the RSD's reach in 2005, the minimum score a school needs to avoid takeover was raised from 60 to the state average in a given year. For the 2008-09 school year, the state average was 86.3. Of the charter schools in the RSD, only five scored higher. The RSD will decide this year if it will return schools to Orleans Parish control. "But what is being put out there in the propaganda," says Royal, "is that the major post-storm reforms have been widely successful, that [RSD Superintendent Paul] Vallas came in and improved the school system. I work directly with parents, and they tell me that their children with special needs are having a hard time constantly being bounced from school to school." The complaint lists more than a dozen stories of children with depression, autism, blindness and behavioral disorders who are being punished and neglected. It also tells of parents who have been turned away by schools that told them they couldn't help their children. Vallas said in a Times-Picayune article that parents "can vote with [their] feet" if they aren't getting the school they need. He is currently working on revisions to the RSD enrollment process to accommodate more special-needs students, including giving students with disabilities their own special application. Royal, in turn, says that Vallas' response was "irresponsible": "Telling parents that if they don't like it, find another school, is besides the point, when all schools and all teachers are supposed to be accessible to disabled children." Parents might have a choice about which school to send their children to, but schools do not have a choice about whether they can teach disabled children. And children can't vote with their feet if they're in a wheelchair. New Orleans has a unique need for qualified, special-needs-trained teachers. Many of the students who lived through Katrina and the floods suffer from a range of mental and emotional problems. A study recently released by Columbia University found that 37 percent of children from the families surveyed had a clinical mental health diagnosis. Also, children exposed to Katrina were five times as likely to exhibit serious emotional disturbance as a child before Katrina. Despite the need to address all of these problems in a city committed to charter schools, the state was overlooked by the federal Race to the Top competitive grant — twice. While media headlines have offered up charter schools as a savior, someone in D.C. must know better.